Professor F W Newman was president of the Vegetarian Society, based in Manchester and founded in 1847, from 1873-84. He was a controversial character, influencing the Society to accept associate members and refusing to accept that anything else should be associated with vegetarianism. Until then, many had combined vegetarianism with a campaign against alcohol and smoking. 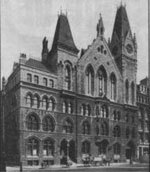 In London in 1875 a Dietetic Reform Society was formed, this appears to have been based from the outset in the Memorial Hall, Farringdon Street which was also opened in 1875 (photo right from 1930). Members abstained from alcohol and tobacco as well as being vegetarian. This was followed by the London Food Reform Society in 1877. A young doctor named T R Allinson (now immortalised on a popular brand of wholemeal bread) was a member of the Society. Later, the Society dropped the word "London" from its title and became the National Food Reform Society. This led to some antagonism with the Vegetarian Society, but the National Food Reform Society merged with the Vegetarian Society in 1885, and it then became the London branch of the Vegetarian Society. Further problems followed, and in 1888 the London branch broke away from the Vegetarian Society and formed the London Vegetarian Society, which soon flourished as a second national society. The President was Mr Arnold Hills (1857-1927 photo right) - he was probably President of the various Food Reform Societies and appears to have been connected with the Memorial Hall which was owned by the Congregationalist Church. A magazine known as The Vegetarian was brought out in 1889 by Mr Hills as an independent publication to run alongside the LVS. On October 1, 1889, the LVS initiated the Vegetarian Federal Union based in the same offices in Farringdon Street and with the same personnel. next to him in the light suit is his friend Dr. Josiah Oldfield. ... I was elected to the Executive Committee of the [London] Vegetarian Society, and made it a point to attend every one of its meetings, but I always felt tongue tied ... Meantime a serious question came up for discussion. I thought it wrong to be absent and felt it cowardice to register a silent vote. The discussion arose somewhat in this wise. The President of the Society was Mr Hills, proprietor of the Thames Iron Works. He was a puritan. It may be said that the existence of the Society depended practically on his financial assistance. Many members of the Committee were more or less his protégés. Dr Allinson of vegetarian fame was also a member of the Committee. He was an advocate of the then new birth control movement, and preached its methods among the working classes. Mr Hills regarded these methods as cutting at the roots of morals. He thought that the Vegetarian Society had for its object not only dietetic but also moral reform, and that a man of Dr Allinson's anti-puritanical views should not be allowed to remain in the society. A motion was therefore brought for his removal. The question deeply interested me, I considered Dr Allinson's views regarding artificial methods of birth control as dangerous, and I believed that Mr Hills was entitled as a puritan to oppose him. I had also a high regard for Mr Hills and his generosity. But I thought that it was quite improper to exclude a man from a vegetarian society simply because he refused to regard puritan morals as as one of the objects of the society. Mr Hills' view regarding the exclusion of anti-puritans from the Society was peculiar to himself, and it had nothing to do with the declared object of the Society, which was simply the promotion of vegetarianism and not of any system of morality. I therefore held that any vegetarian could be a member of the Society irrespective of his views on other morals. [Gandhi goes on to explain how he found it difficult to explain his views so he wrote them down and someone else read them] ... Dr Allinson lost the day ... I have a faint recollection that, after this incident, I resigned from the committee. 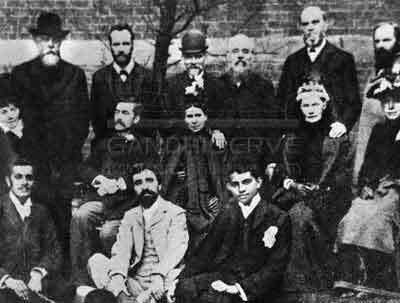 Gandhi was in London from 1888, when he was 18, to 1891, when he was 21 - so the wise views above were formed when he was only about 20. His account of this incident on the Committee throws further light on the 'problems' between the Manchester based Society and the group in London. Mr Hills was an inspiring speaker and the next time he visited Birmingham called together a group of business men and said: "I would like to see a first-class vegetarian Restaurant in Birmingham and if you will start it I will subscribe ten per cent of the cost". In 1896, it so happened that a new building was being erected in Corporation Street, Birmingham. After much deliberation, the consortium of business men rented the whole of the basement and ground floor to use as a Vegetarian restaurant. As I was very keen on the whole idea, I was appointed manager. Then the landlord asked us if we would take the whole of the seven storey building and convert the upper five storeys into an hotel. In the summer of 1898 the first Vegetarian hotel in England, called 'The Pitman Vegetarian Hotel', was opened and I was made manager of that too. The hotel was named after Sir Isaac Pitman, inventor of Pitman Short-hand, who had been a Vegetarian for 60 years, and at the time was the best known vegetarian in England. In 1908 the Secretary of the LVS was planning to attend the first IVU Congress in Dresden, Germany, she was unable to attend but sent a letter of support. Miss Nicholson [LVS Secretary] spoke of her excellent work in London, especially that connected with the feeding of poor children. Her heroic effort in this department has gained her public recognition from the Education Committee of the London County Council. Now that she had got her foot in, she said she did not meant to take it out, and she owed it all to vegetarianism. Her energy is amazing and she speaks well for the diet. 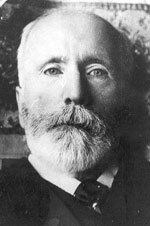 At the 1910 Congress, in Brussels, Arnold Hills was named as a Membre d'honneur of the Congress Committee, he does not appear to have made the journey in person. A report from Miss Nicholson was read by a delegate from the Manchester Society. The reports from the 1913 Congress make no direct mention of LVS. 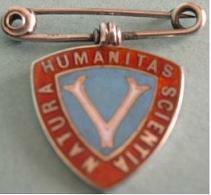 The photo on the right shows a pin produced by the London Society in 1915. (from Jan Stastny, Prague). The LVA magazine became the Vegetarian News in 1921. At the Congress in 1923, in Stockholm, LVS was represented by Charles W. Forward (photo right) who had been a prominent member of the society for many years, his position at this time was not clear. He presented a paper on "Vegetarianism and its Basis of Scientific Truth". Frank Wyatt, the LVS Secretary gave a "Report for London Vegetarian Society". 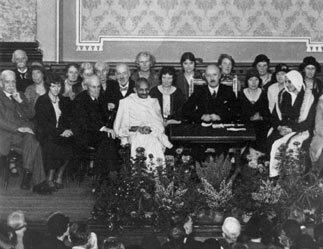 6th World Vegetarian Congress - 1926 London, England - organised jointly by the LVS and the Vegetarian Society, Manchester. This report includes a lot of details, and photos, of London in that year. The LVS President in 1926 was Dr. Bertrand P. Allinson, M.R.C.S., L.R.C.P. - presumably the same Dr Allinson that the young Gandhi had tried to keep on the committee 36 years earlier. The British Societies were represented by four delegates and it is worthy of note that each delegate is a member of both the Vegetarian Society and the London Vegetarian Society. It is also gratifying to place on record that the two Societies joined in one national report, presented by Mr. James Hough, and co-operated throughout the Congress in the many events in whch the British representatives were asked to take part. The Vegetarian Society and the London Vegetarian Society each sent two delegates, the former being represented by Dr. Walter Walsh and Mr. James Hough, and the latter by Mrs. Harold Goddard and Mr. Frank Wyatt. It was at least a source of satisfaction to the British delegates themselves that all four were actually members of both societies. The 1932 IVU Congress was held in Berlin and Hamburg, Germany. Frank Wyatt, the LVS Secretary was the chairman of one of the sessions and was later elected to the IVU Committee. By the 1930s it is clear that the London and Manchester based Societies were working as one group during the IVU Congresses. See The Vegetarian Society (UK) and IVU, 1930s for further details. World War II was a difficult time for vegetarians. The Committee of Vegetarian Interests was formed, with representatives from the two Vegetarian Societies, health food manufacturers and health food retailers to liaise with the Ministry of Food and win concessions. Vegetarians were allowed an extra ration of cheese and the committee was very concerned about ensuring the preferential distribution of nuts to vegetarians. As the number of registered vegetarians increased sharply during the years of rationing, it was suspected some non-vegetarians were signing up to claim the extra nuts and cheese! This resulted in considerable discussion about the definition of vegetarian and methods of ensuring that only bona fide vegetarians could draw the extra rations. The picture on the right is from a publication called This Other Eden, a vegetarian starter kit from the 1940s. (Sent by Jan Stastny, Prague). ... Final Assembly in London. Reports from the 1950 IVU Congress, in the Netherlands, mentions representatives from London including a joint resolution from Roy Walker (London Sec.) and the Manchester secretary. The Committee of Vegetarian Interests continued for many years after the war, including representatives of vegetarian restaurateurs, the Vegetarian Catering Association and the Plantmilk Society. As rationing ended, they turned their attention to such things as the introduction of a vegetarian class in the Salon Culinaire competition, the production of cheese with non-animal rennet, standards in vegetarian catering and the establishment of soya milk manufacturing in this country. The Vegetarian Messenger [the magazine of the Vegetarian Society GB] was renamed The Vegetarian in 1953. During the 1950s and 60s, the Societies increasingly began to work together, and after 1958 combined to replace their magazines with a joint publication, the Vegetarian News and The Vegetarian were replaced by The British Vegetarian, which continued as a bi-monthly magazine until 1971. In 1969, the two societies amalgamated to form one society again, this is the organisation we have today, The Vegetarian Society of the United Kingdom Ltd.